It makes sense to put the letting and management of your property in the hands of our experts. 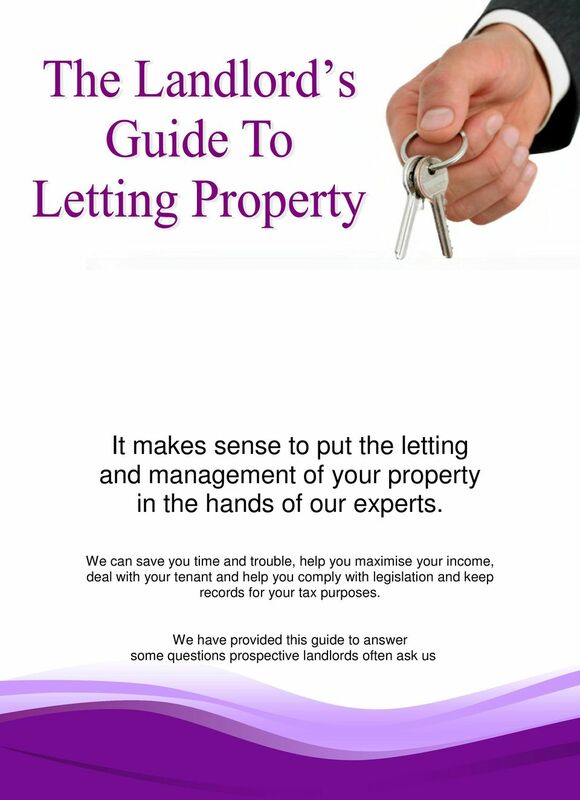 Download "It makes sense to put the letting and management of your property in the hands of our experts." 2 Is there a high demand for rented property? Since the late 1980 s with amendments to landlord and tenant legislation and changes in people s attitude to renting have created an active private rental sector. Demand obviously varies from time to time and area to area, but there s always a need for good quality residential property offered at sensible rates. How do you select a prospective tenant? We make reasonable enquiries by using referencing and credit checking facilities to establish the suitability of a prospective tenant. We discuss the results with you directly or sometimes use our own professional judgement on your behalf. Prospective tenants are responsible for paying a referencing fee. How do I prepare the property? We have found that a good relationship with Tenants is an important key to a smooth-running tenancy. It is important that the Tenants should feel comfortable in their home and that they feel they are receiving value for money. At the commencement of the tenancy the property must be in a thoroughly clean condition, and at the end of each tenancy it is the Tenants responsibility to leave the property in a similar condition. Where they fail to do so, cleaning can be arranged at their expense from their security Deposit. What do I need to leave in the property? This depends on your individual circumstances and the prospective tenant s needs we can give you some guidance on this. You may choose to leave your property unfurnished with just carpets, curtains, light fittings, partially furnished or fully furnished with everything the tenants need to move straight in. We recommend you don t leave anything personal, sentimental or of high value in the property. Remember that there will be wear and tear on the property in good decorative order (preferably plain, light and neutral colours) will be likely to achieve a higher rental figure and encourage a good Tenant relationship, plus Tenants are also then more inclined to treat such a property with greater respect. What information does the tenant need? It is helpful if you compile an information file for tenants to leave at the property. As a matter of safety, include operation manuals on all appliances, eg: washing machine, alarm systems and operating instructions for the central heating and hot water system, service providers contact details and the day refuse is collected etc. Are pets, children, smokers or students allowed to move into the property? This is entirely up to you and we ll follow your guidelines when searching for a suitable tenant. But remember the more restrictions you make on your property, the more you reduce its potential appeal. What about an Energy Performance Certificate (EPC)? Energy Performance Certificates (EPC s) have been introduced to help improve the energy efficiency of buildings. If you are going to rent a home out you now need a certificate by law. We can arrange this on your behalf if required. The certificate for a rented property lasts for a 10 year period. 3 Is your property a House in Multiple Occupation (HMO)? If your property is on 3 or more levels and let to 5 or more tenants comprising 2 or more households (i.e. not all of the same family) it will be subject to mandatory licensing by your local authority. Whether mandatory licensing as above applies or not, if there are 3 or more tenants not all related in any property, it is still likely to me an HMO and special Management rules apply. See What are the safety requirements for rented properties? As a landlord, you have a duty to ensure your rented property is safe to live in. repairs and maintenance are at the Landlords expense unless misuse can be established. If you don t follow the safety regulations, you risk prosecution this could lead to a fine or prison sentence. Your tenant could also file a civil claim for substantial damages. The regulations you need to follow cover the safety of furniture and furnishings, gas appliances and associated fittings, heating an electrical appliances also need to be in safe working order. We will be happy to assist our clients with their compliance of the safety regulations. How do I get my property back? We usually recommend you let your property on a fixed term tenancy. Normally you will get possession of your property back at the end of this. If we re managing your property, we ll send out the correct notices at the right time so you can regain possession. On the rare occasion a tenant doesn t move out at the end of the tenancy, it may be necessary for you to take court action to recover the property. What precautions should I consider taking when my property is empty? Any empty property is potentially at risk, particularly the winter months. You should inform your buildings and contents insurers, and comply with any of their requirements if the property is empty. Note: when appointed as letting managing agents we are only responsible for management of the property whilst it is let to a tenant. 4 What choice of lettings services do you offer and what are the charges? FULL LETTING AND MANAGEMENT AND TENANT FIND ONLY They are briefly explained over the following pages but please ask any of our staff to explain these in more detail. Who is liable for the repairs to my property and the maintenance of my appliances? You are responsible for maintaining and repairing the structure, fittings and fixtures of your property. If we re managing the property for you, we ll arrange for a local contractor to carry out necessary repair work. This will be at your expense and we will try and obtain your authorisation before proceeding. If any of your appliances have service contracts, maintenance agreements or are under guarantee, please make sure you supply us with the details and a copy of any documents. We also recommend you leave a duplicate set or copies of any instruction booklets in the property, so your tenants can use them safely and correctly. How do you pay me rent? We will collect and pay it at regular intervals into your bank or building society account after deducting fees and expenses. We ll send you regular statements showing regular income and expenditure. On a find a tenant only basis we will arrange for the tenant to pay you directly. What happens if the tenant doesn t pay their rent? If we re managing your property we ll try our best to obtain any outstanding rent and keep you informed of our progress. If it becomes necessary for you to take legal action, we ll let you know what steps you need to take. Do you inspect my property during the tenancy? Yes, if we re managing your property, we ll normally visit at regular intervals to check on its general condition. If we re not satisfied with this, we ll take appropriate action with the tenant. How long should the tenancy be for? We recommend your tenancy lasts for a minimum of six months and a maximum of 12 months, at any one time. In our experience, this gives you and the tenant the benefit of some commitment, as well as flexibility if either of your circumstances change. Naturally, we ll be happy to re-let your property to anew tenant when necessary. Who signs the tenancy agreement? 5 Both landlord and tenant need to sign the agreement. As your agent, we can sign it on your behalf. What about keys? You should provide one set of keys for each Tenant. You should keep a set of spare keys yourself and if we are managing the let we will also require a set. Who is responsible for paying gas, electric, water and council tax bills? Unless agreed otherwise, our tenancy agreement states the tenant is responsible for these services, the TV licence and telecom costs. During any period your property is empty, for example between tenancies or after the property is tenanted, you are responsible for these accounts. What about insuring the tenants possessions? It s the tenant s responsibility to insure all their personal belongings. What happens about the garden? Before letting landlords should ensure gardens are neat, tidy and rubbish free, with any lawns cut. Under our tenancy agreement, the tenant is then responsible for the reasonable maintenance of the garden, taking into account its original state and seasonal conditions. You should leave appropriate garden tools at the property, for example, a lawn mower. However, few Tenants are experienced gardeners. If you have a big or elaborate garden that requires professional knowledge or extensive care, we recommend you consider hiring a gardener. Do you take a deposit for the tenant? Yes Severn Estates can deal with this on your behalf. It is quite common for a landlord to ask for a deposit equivalent to one or two months rent. The deposit is held during the tenancy against the satisfactory performance by the tenant of all the obligations under the tenancy agreement; but mainly, those relating to the cleanliness and condition of the property. Under legislation, which came into effect on 06 th April 2007, any landlord or agent who takes a deposit from a tenant(s) for an Assured Shorthold Tenancy must safeguard it in an approved Tenancy Deposit Scheme. This means at the end of the tenancy, in the event of an unresolved dispute over the allocation of the deposit, it can be referred to the scheme for a prompt, independent, third party adjudication, thus providing a resolution, which is fair to both landlord and tenant. Is the tenant charged for damage? Yes, we take the cost of any damage, excluding fair wear and tear, out of tenant s deposit. If the cost is more than the deposit, then they are liable to pay the difference. 6 Do I need an inventory and schedule of condition? Yes This is an absolutely essential document that provides a written benchmark at the start of every new tenancy. The document should be amended, updated and recreated before the beginning of each new tenancy. A properly constructed Inventory and Schedule of Condition details the fixtures and fittings and describes their condition and that of the property generally. It is a document that helps protect the interests of both landlord and tenant. Severn Estates can prepare this document on your behalf for an additional fee and a copy will be provided to both parties at the start of the tenancy. Any agreed amendments may be noted within the first seven days of any new tenancy. Do Severn Estates provide the tenancy agreement? Yes, we can produce the tenancy agreements for landlords which are fair and up to-date. What types of tenancy are available? If you let your property to a private individual, you should use an Assured Shorthold Tenancy. If you let your property to a company looking for accommodation for their employees, you need a different type of tenancy agreement. We can advise you on the most suitable for you. Smoke Alarms Although there is no legislation requiring smoke alarms to be fitted in other ordinary tenanted properties, it is generally considered that the common law duty of care means that Landlords and their Agents could be liable should a fire cause injury or damage in a tenanted property where smoke alarms are not fitted. We therefore strongly recommend that the landlord fit at least one alarm on each floor (in the hall and landing areas). The Housing Health and Safety Rating System (HHSRS) The HHSRS provides an analysis of how hazardous a property is through assessment of 29 potential hazards found in housing. Landlords have to maintain their properties to provide a safe and healthy environment. The HHSRS is enforced by local authorities. For further information visit What is the legislation regarding furnishings? It is an offence to supply soft furnishings, which do not meet fire resistance standards and do not carry permanent labels to that effect. Soft furnishings include mattresses, divan bases, upholstered sofas / chairs and cushions. Curtains and carpet are not included within the regulations. Furniture with upholstery manufactured prior to 1950's is exempt. An example of the label required shows a picture of a smoking cigarette and flaming match. Remember to keep all receipts for purchase of furniture and retail the statutory disposal labels (those not permanently attached) in a safe place in case tenants wish to enquire as to the compliance of any particular item of furniture. 7 What happens about my buildings and contents insurance? These both remain your responsibility. You must tell your insurers in writing that you intend to let out your property. You may find they want to impose certain restrictions on your cover or increase the premiums. Alternatively, we offer a range of competitively priced insurance products designed specially for Landlords, providing extra security and peace of mind. Gas Safety Requirements It is the duty of the owner and a legal requirement to ensure that all gas appliances and flues are maintained in a safe condition and inspected and checked for safety at least every 12 months by a Gas Safe registered engineer. A Gas Safety Certificate (GSC) should be issued by the CORGI Engineer and must record the gas appliances in the property, dates of inspection and any defects identified and the remedial action taken. Appliances, which typically need to be checked, include gas central heating boilers, ovens, hobs, water heaters and room heaters that are run on either mains gas or LPG (Liquid Petroleum Gas). Whenever possible, ensure that operating instructions booklets for each gas appliance are available at the property for tenants to refer to. Remember, apart from the obvious safety implications, it is a criminal offence not to comply with the gas safety regulations. Electrical Safety Requirements While at present there is no statutory annual testing requirement, we thoroughly recommend that prior to letting; your property has the appropriate checks and safeguards carried out to meet the requirements to the regulations. It is important that landlords understand they have a duty to ensure that the fixed electrical installation (i.e. the mains wiring) and any supplied domestic appliances and other electrical equipment in a rental property is safe to use and in good repair. The regulations cover all mains voltage electrical goods. Examples of appliances covered by these regulations include; cookers, kettles, toasters, electric blankets, immersion heaters, washing machines, dishwashers, microwave ovens, refrigerators, etc. We recommend that a portable appliance test (PAT) certificate be provided by a suitably qualified engineer prior to the initial letting of your property and annually thereafter. Any non-repairable items must be replaced or removed. The manufacturers operating instructions for each appliance must be available at the property to help tenants use the equipment safely. It is important that an NICEIC or similarly qualified electrical engineer checks the fixed electrical installation for safety. This ensures the wiring, sockets, light fittings, etc. are sound and that fittings like showers, electric cookers and immersion heaters are deemed safe. The Institute of Electrical Engineers (IEE) recommends that this be carried out at least every ten years in a domestic environment. 8 Option 1 - The Tenant Finding With Full Management Service For our up to date management fees please contact the office on the numbers at the end of this guide This service is aimed at making things as easy as we can for property owners by keeping landlords involvement to a minimum. We try to take care of as much as possible from start to finish and this option is especially good for landlords who do not live locally or are busy with other businesses. The service includes:- Finding a tenant We arrange extensive advertising, deal with enquiries and arrange viewings Once the letting commences there is an administration charge. Taking references and making credit checks about prospective tenants. A non-refundable charge is made to each tenant (Compulsory for Managed Properties). There is a charge for Issuing Section 21 notices and renewing Severn Lets tenancies. Management Includes:- Providing a full inventory of contents and condition at the start and end of the tenancy. Handling tenants bond and administering Tenancy Deposit Scheme FREE OF CHARGE TO THE LANDLORD. Informing the services of changes of occupancy. Rent collection We make collection and payments are credited automatically to the Landlord s nominated bank account. We monitor tenants payments and issue reminders to the tenant by letter and or telephone, or text message. Advice on the 1997 Housing Act including the Landlord s obligations regarding electric, gas and soft furnishings. 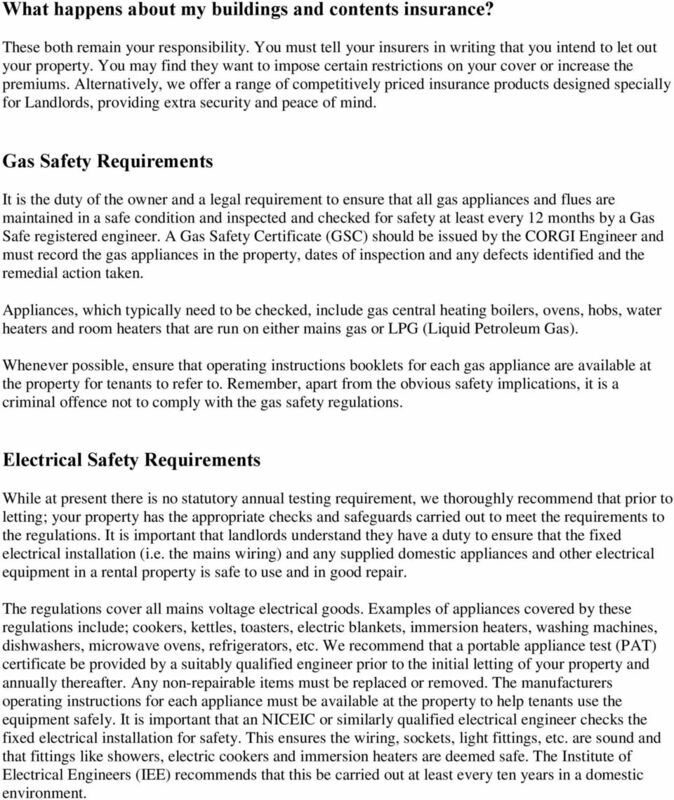 Arranging the landlord s gas certificates and any necessary electrical checks. Checking the property regularly regarding maintenance and condition. Arranging repairs and maintenance. Serving statutory notices to the tenants. Providing expenditure accounts. 9 Option 2 Let Only For our up to date fees please contact the office on the numbers at the end of this guide Mainly of interest to landlords who have the time and inclination to manage their own maintenance and letting once we have introduced a suitable tenant and helped by arranging the letting to start with. Our tenant finding service includes extensive advertising and arranging viewings. We can also provide additional assistance with: Preparation of tenancy agreement. Taking references, credit checks and arranging a guarantor if necessary. Inventory for the property. We advise Landlords of non managed properties to carry out a detailed inventory of condition and contents including outside areas. The Let Only service does not include inventories and condition and we will not be responsible for resolving deposit (bond) disputes on unmanaged lettings. For a full comprehensive service we suggest our Management Service. Found Your Own Tenant? If you already have a tenant in mind, we can still give you extra peace of mind and you save money by not paying our tenant finding service. The extra services below will assist you with your letting and help you7 avoid uncomfortable direct personal contact with your tenant. We endeavour to save you time and hassle and minimise the chance of stumbling across pitfalls with your tenant in the future. We can also provide additional assistance with: Preparation of a Shorthold Tenancy Agreement. Credit check and tenant or guarantor referencing. Rent collection we take collection, monitor tenants payments and issue reminders to the tenant by letter and or telephone, or text message. FOR MORE INFORMATION PLEASE CALL US ON OR OR US ON Although care and attention has been taken in preparing this guide it is only meant as an introduction to letting and is not comprehensive in all aspects and may not include changes to or new/recent legislation. In simple terms your return on investment of renting out a property is affected by two main things: rental income and your expenses. Landlord Guide. We offer a sensible and straightforward pricing structure and operate on a no let; no fee basis. Introduction 1. Accommodation 2. Safety and Household Furnishings 3. Responsibilities 4. Taxation 5. Insurance 6. Rental 7. 1. Do your research. Speak to local letting agents. They can provide great insights. P1/terms & conditions/ Agency Contract Terms and Conditions Full address of property to be let: Post Code: Full name of Landlord : Address: Tel (Mbl) Post Code: Email Address: Agreed initial Rental:.. If, however, you have any further questions that we have not answered here, then please do not hesitate to contact us. 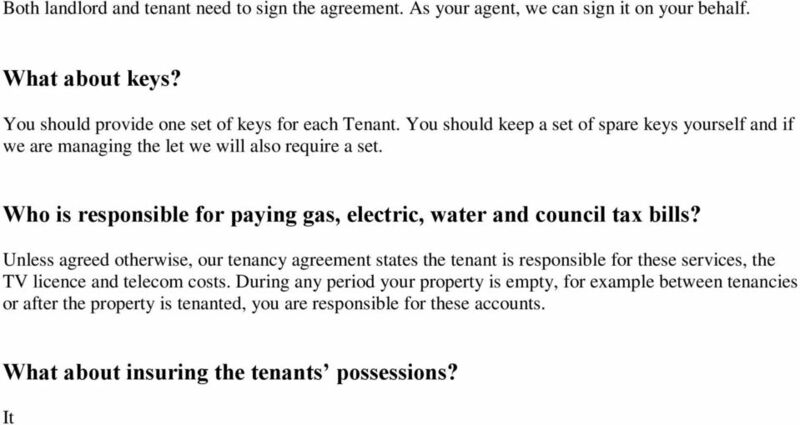 Tenancy Agreement. Document Template provided by www.makeurmove.co.uk. Intended for use in the UK only. Does a landlord have to have an electrical inspection carried out? Bob Miller, Head of Housing Services at the University of London spoke to Vincenzo Rampulla at the National Landlords Association (NLA) about electrical and fire safety in private rented accommodation. We most sincerely hope that you have a trouble-free move into your new home. Terms and Conditions 1. 3.8. 2. 3.9. 3. The Tenant will: 3.1. 3.2. 3.10. 3.3. 3.11. 3.4. 3.12. 3.5. 3.13. 3.6. 3.14. 3.15. 3.7. 3.16. LONDON BOROUGH OF BARKING AND DAGENHAM PRIVATE SECTOR HOUSING HMO LICENSING APPLICATION FORM GUIDANCE NOTES NOTES TO PART 1 If you are the person filling in this application form, then you are the applicant. This guide is aimed to help you consider the right choices before adding new or further buy to let property to your investment portfolio. GUIDE TO RENTING IN THE UK How to rent a property in the UK The process of renting a home and your tenant rights may differ across the world, but there are some generic considerations that remain the same.